Srujana holds Master of Computer Applications degree from Osmania University, Hyberabad, India. She is currently working as a Java/J2EE Consultant and has experience of working with a number of clients in a variety of domains. When I just heard about Spring Boot there were many questions to pop out of my head “What is it? Why do I need it? How different is it to the other features under the same Spring umbrella?” etc. I am sure you would have had similar inquisitions too. In short, Spring Boot takes care of application infrastructure while you can focus on coding the actual business flesh. Surely fast tracks building of applications. It makes reasonable assumptions of the dependencies and adds them accordingly. It also lets you customize the dependencies according to your requirement. 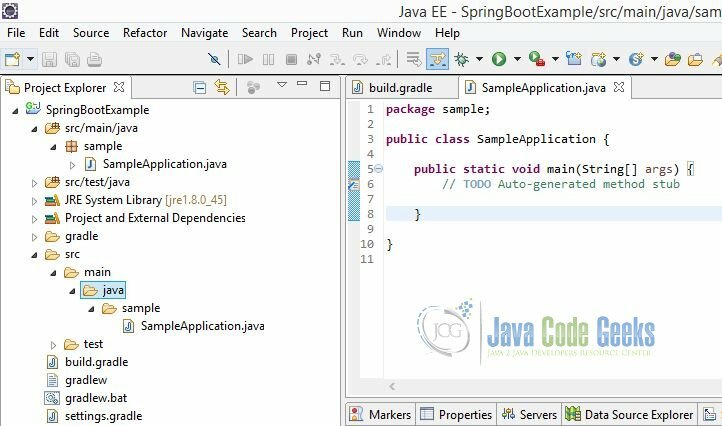 In the following sections, I am going to site a sample application example using Spring Boot. In addition to the above you need the following to work on this sample application. This tutorial assumes that you have basic understanding of Spring framework. Take a moment to read the suggestions in the following screen. Press next. 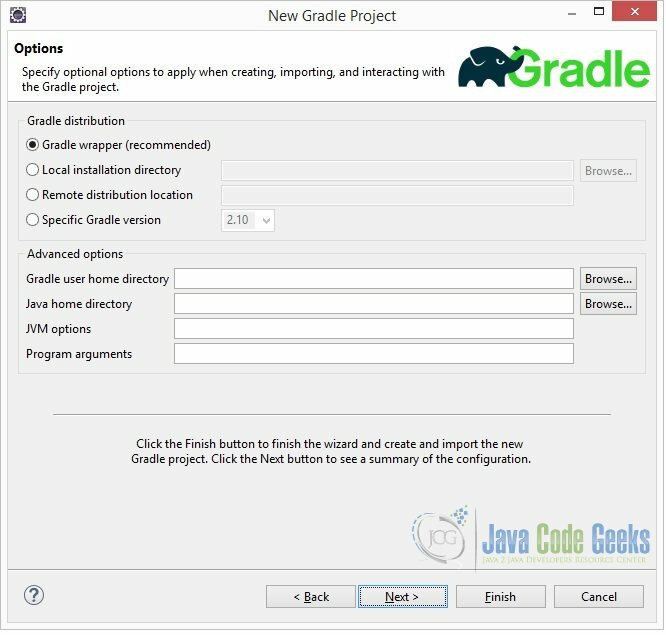 Keep the default and recommended Gradle Wrapper option selected and press next. Press finish on the preview screen. You have successfully created the Gradle project. 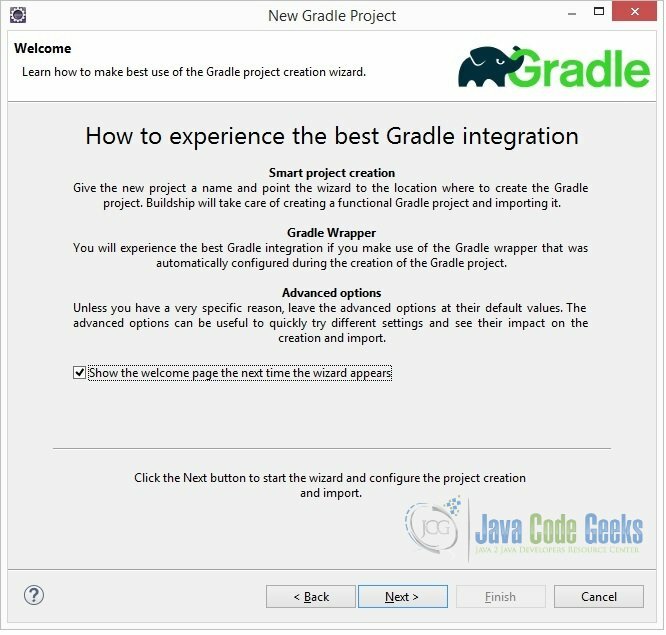 The following is the project structure of your Gradle project. 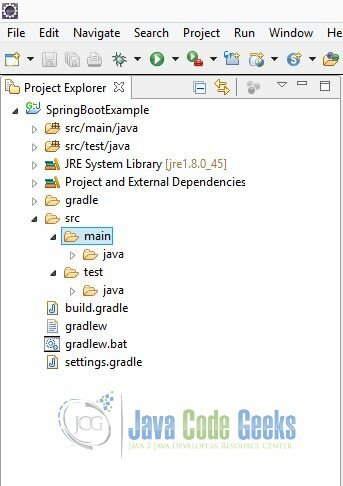 In the Eclipse IDE, open the build.gradle file that is in the project root directory. Modify the file as shown below. 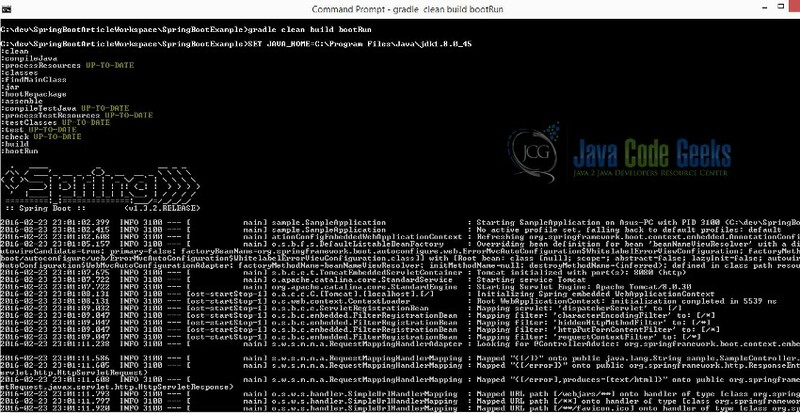 The buildscript() method is used to add any external libraries to script’s classpath, by passing in a closure that declares the build script classpath using classpath configuration. 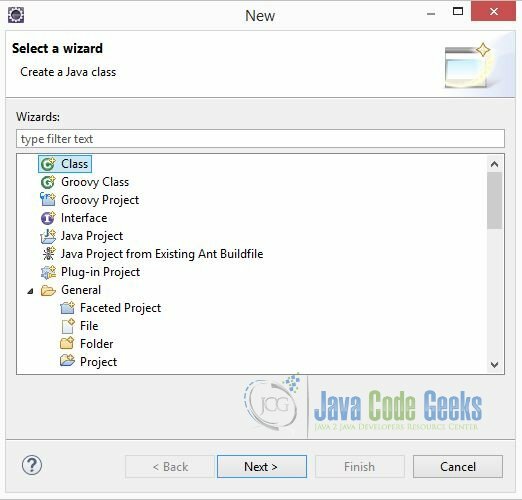 Any binary plugins that have been published as external jars can be added to the project by adding them to the classpath configuration and then applying the plugin. In our example, spring-boot-gradle-plugin is the binary plugin that needs to be added to our project. And apply plugin:"spring-boot" is used to apply the plugin. 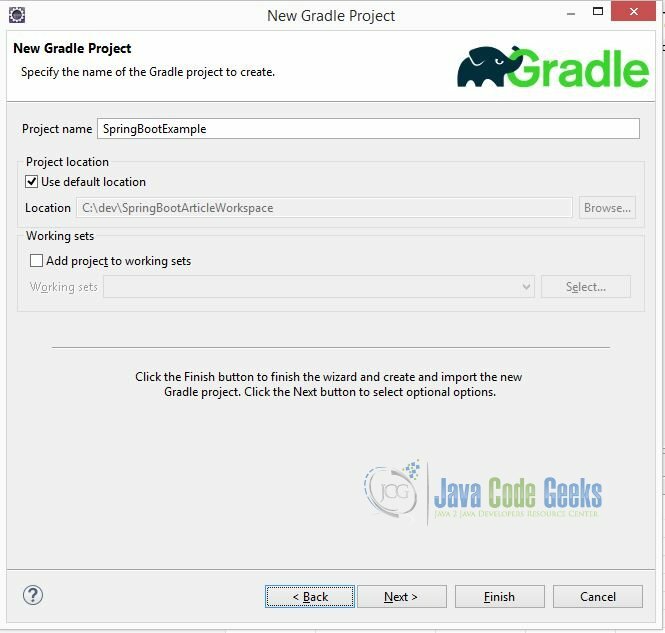 Spring Boot Gradle plugin is added to project to provide Spring Boot support in Gradle. 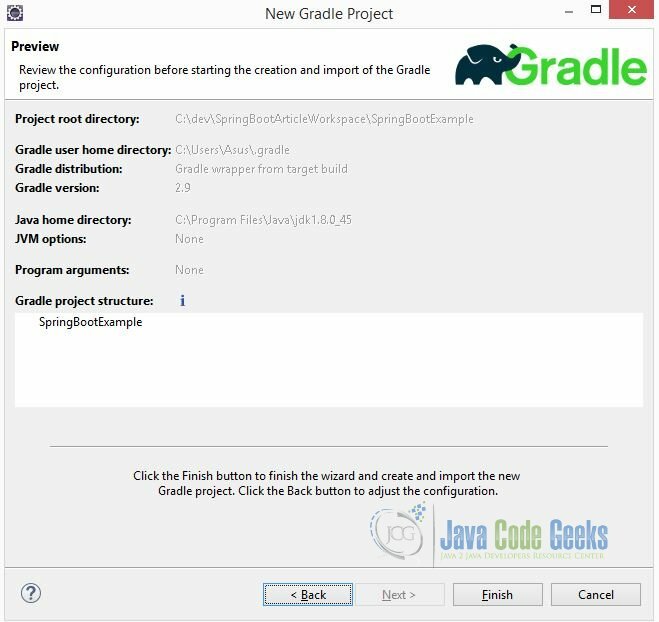 Follow the link Spring Boot Gradle plugin to dig further about this plugin. 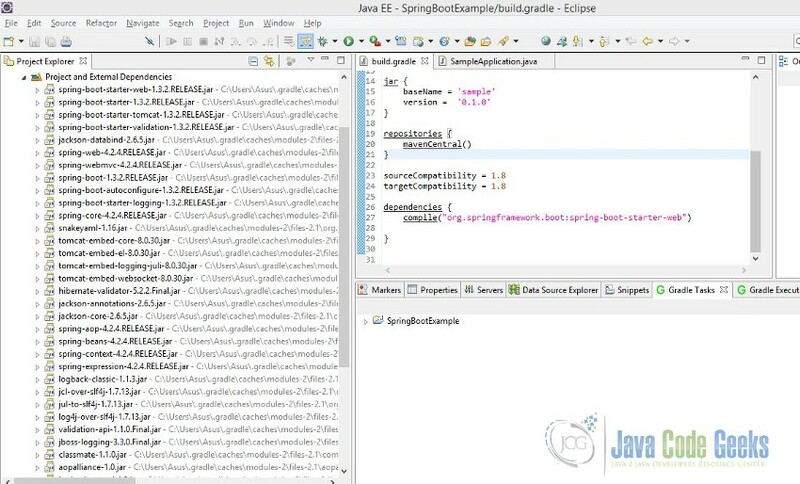 The java plugin adds compilation, testing and bundling capabilities to the project. 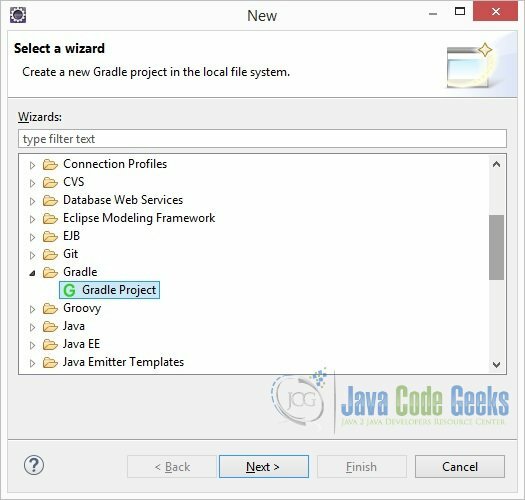 When build using the tasks from the eclipse plugin, certain files are added to project to enable it to get imported into Eclipse IDE. When the project is built with gradle clean build, the jar file with name sample-0.1.0.jar is created in the $PROJECT_ROOT/build/lib folder of the project. This is to specify the repository where the dependencies will be downloaded from. The sourceCompatibility is Java version compatibility to use when compiling Java source. Default value is version of the current JVM in use. The targetCompatibility is Java version to generate classes for. The default value is sourceCompatibility. To specify the required dependency for Spring Boot. During build process, Spring Boot Gradle plugin looks for class with public static void main() to flag it as runnable class. As we haven’t created a class with public static void main() yet, the build fails as shown below. Let’s create a simple runnable class with public static void main(). 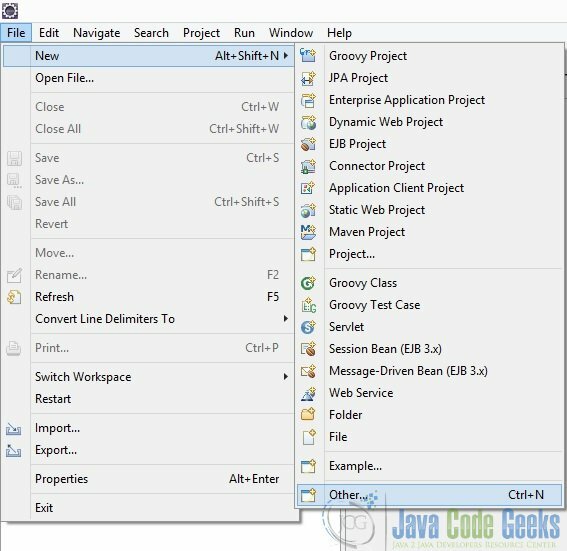 In Eclipse IDE, right click on source folder src/main/java and select New -> Other. 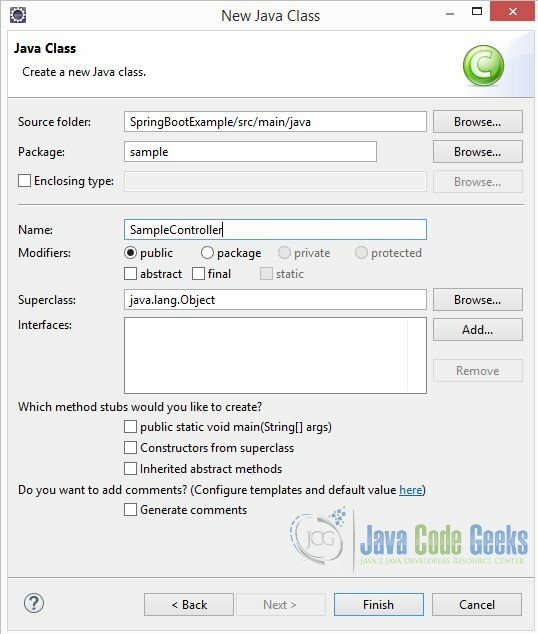 Specify the package name “sample”, class name “SampleApplication” and select to create public static void main(String args) method, as shown in the below picture. Click on “Finish”. After creating SampleApplication.java, the project structure looks as below. As shown below the build is now successful. As shown below Spring Boot makes reasonable assumptions of the dependencies and adds them automatically. Project Dependencies added by Spring Boot. 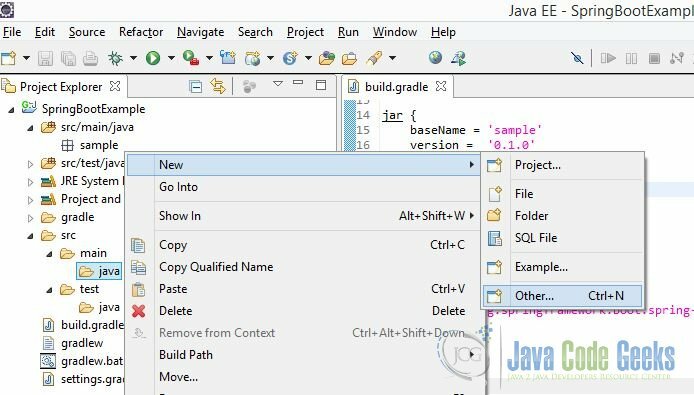 In Eclipse IDE, right click on source folder src/main/java and select New -> Other. Specify the package name “sample”, class name “SampleController”. Click on “Finish”. Following is the current snapshot of the project structure. Modify SampleController.java as shown below. The @RestController annotation marks the class as controller and adds @Controller and @ResponseBody annotations. The @RequestMapping annotation ensures that HTTP requests to /sample is mapped to the sampleIt() method. As you would have already noticed, we didn’t have to create any web.xml for the mapping. If you are familiar with Spring framework, many-a-times you would have annotated your main class with @Configuration, @ComponentScan and @EnableAutoConfiguration. 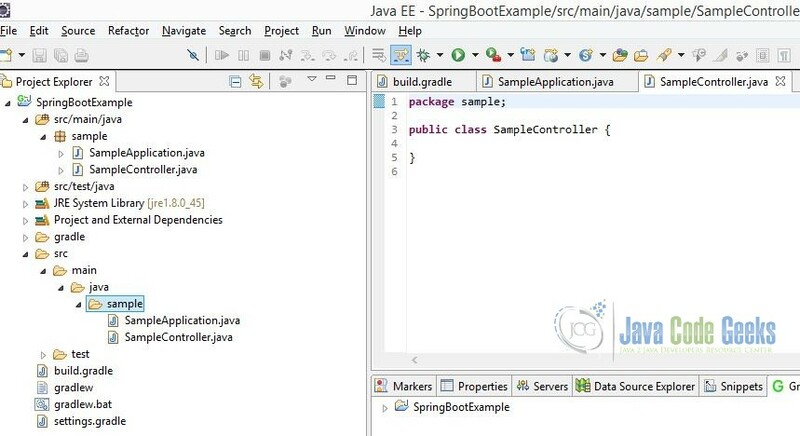 @SpringBootApplication is equivalent to using these three annotations @Configuration, @ComponentScan and @EnableAutoConfiguration with their default attributes. 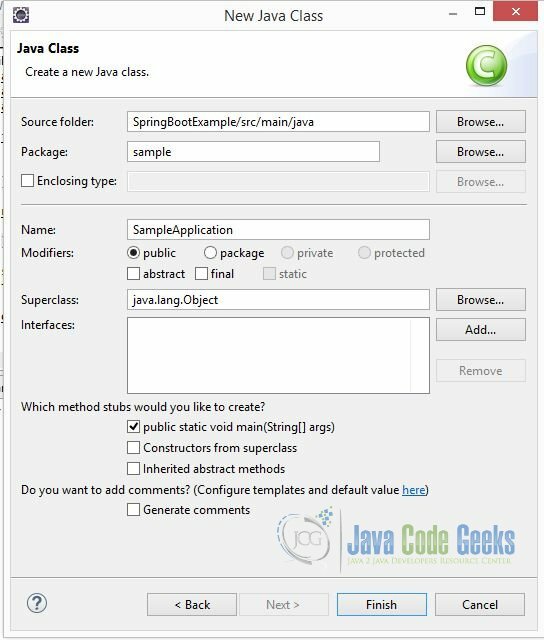 SpringApplication is used to bootstrap and launch a Spring application from the main method. When invoked from browser the output is displayed as below. That’s all Folks!! Make sure you make yourself a cuppa before jumping into additional reading through the links provided in “References” section.